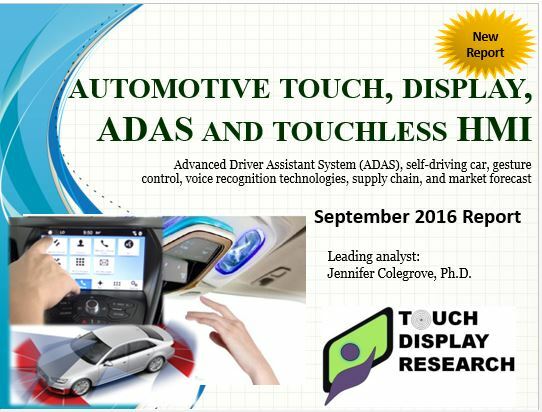 2016 Automotive touch display touchless sensor market report - Touch Display Research, Inc.
Santa Clara, California, November 14, 2016— In the recently published “Automotive touch, display, ADAS and touchless HMI 2016 report,” Touch Display Research Inc., a market research and consulting firm, analyzes automotive touch screen, display, ADAS (Advanced Driver Assistant System), and touchless human-machine-interaction (HMI). Touch Display Research forecasts the overall automotive touch, display, ADAS and touchless HMI market will grow from $15 billion in 2017, to $60 billion in 2023. 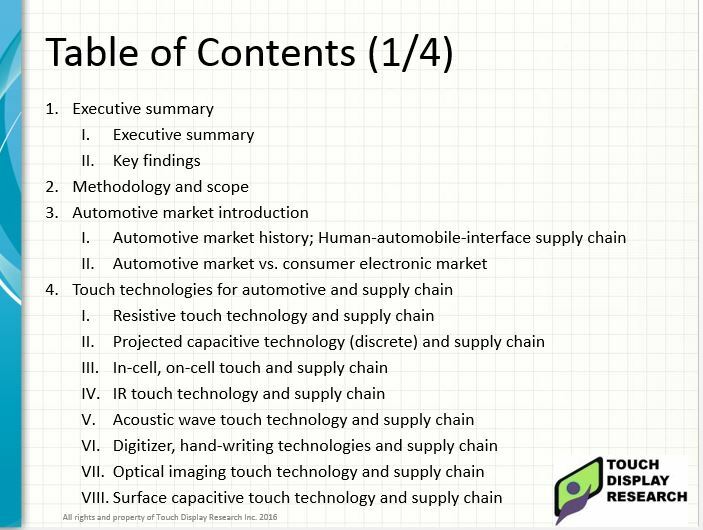 Source: Automotive touch, display, ADAS and touchless 2016 report, September 2016, Touch Display Research Inc. The display for automotive market forecast includes Unit, module ASP and Revenue, with a detail breakdown by TFT LCD, AMOLED, PMLCD, PMOLED, other displays and Head-Up-Display.